This November, a growing and highly engaged LGBTQ voting bloc will play a pivotal role in the presidential, senatorial and other down-ballot races. There are 9.4 million LGBTQ voters in the United States. 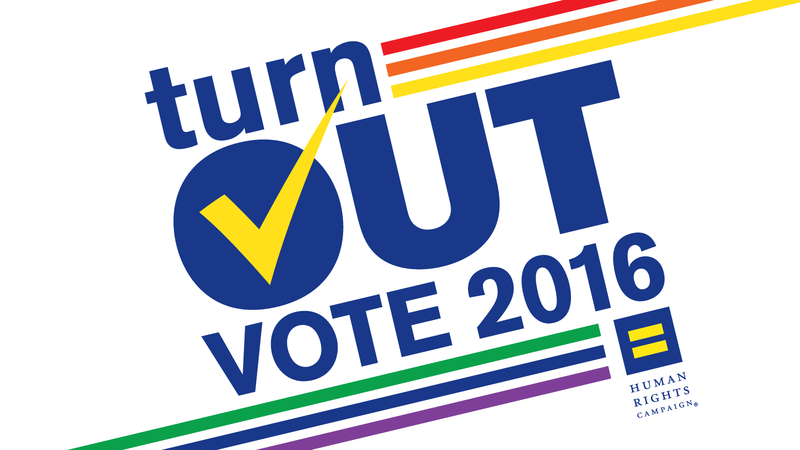 Turnout among LGBTQ voters is also reliably high. In 2012, an astounding 81 percent of eligible LGB voters nationally cast a ballot, compared to just 58 percent of all eligible voters. This bloc was also a crucial piece of the puzzle for President Obama’s victory: in the last election, President Obama received 76 percent of all LGB votes, according to national exit polls. In total, roughly 6 million LGB voters cast a ballot in 2012 -- an election President Obama won by just under 5 million votes. Polling this year showed Secretary Clinton’s support among LGBTQ voters is running even higher than President Obama (for example, this May poll showing 84 percent). Voters will see two of the worst anti-LGBTQ politicians in America on their ballots this fall: Donald Trump and Mike Pence. Time and again, Donald Trump has shamelessly pandered to the LGBTQ community while offering one of the most anti-LGBTQ platforms in recent history. And he doubled down on his anti-LGBTQ agenda with the selection of Mike Pence -- who is known nationally for pushing a discriminatory state law -- as his vice presidential candidate. Trump even responded to the tragic killing of 49 LGBTQ individuals at Pulse nightclub in Orlando by thinking of himself first. Donald Trump insisted that the shooting may not have taken place if more of the victims had been armed and delusionally bragged about fictional support from the LGBTQ community in the immediate wake of the shooting. Vowing to roll back nationwide marriage equality by appointing Supreme Court justices willing to help overturn Obergefell. Pledging to sign the so-called “First Amendment Defense Act,” or FADA, legislation that would enable taxpayer-funded discrimination against LGBTQ people in the federal government. Backing Pence’s right to discriminate bill, which intended to allow Indiana businesses to discriminate and deny services to LGBTQ people because of who they are or whom they love. Undermining the U.S. global efforts to advance LGBTQ equality through our foreign policy. Opposing Department of Education guidance on transgender students’ right to access bathrooms consistent with their gender identity. LGBTQ and pro-equality voters are also looking to the top of the ticket for an ally who will keep building on the progress of the last eight years, and crucially, sign the Equality Act into law. Hillary Clinton has laid out the most robust plan for advancing LGBTQ equality of any presidential candidate ever -- from championing the Equality Act, to wiping out HIV, to addressing hate violence and more. Most Americans are unaware that today, in 31 states -- LGBTQ people are still at risk for being hired, fired, evicted or denied services because of who they are. The Equality Act, a top priority for LGBTQ voters, would rectify that by adding these protections for LGBTQ people into our longstanding civil rights laws. This law has bipartisan backing in Congress and the support of more than 80 leading companies -- and the nonpartisan Public Religion Research Institute (PRRI) found this year that 71 percent of Americans favor such a bill. In fact, 84 percent of all voters already believe it’s a law we already have on the books. 1 The 2012 NEP reported that 5 percent (http://elections.nytimes.com/2012/results/president/exit-polls) of the 129,085,403 voters (http://www.presidency.ucsb.edu/data/turnout.php) in that election identified as gay, lesbian, or bisexual, which means that approximately 6,454,270 voters identified as LGB. According to the Williams Institute (http://williamsinstitute.law.ucla.edu/wp-content/uploads/Gates-How-Many-People-LGBT-Apr-2011.pdf), there are about 8 million LGB adults in the United States. 2012 LGB voters then participated at a rate of 81 percent compared to the LGB voting-age-population. 2 Exit polls did not ask demographic information to identify transgender voters. 3 Determined using the United States Census population data and GALLUP polling estimates of LGBTQ population percentages per state. Paid for by Human Rights Campaign PAC and not authorized by any candidate or candidate’s committee.